Motherboards are extremely important in the world of computers. They are the primary communication bridge between all the components and the CPU. A gaming computer's performance is heavily dictated by two components, the processor and motherboard. It is important to buy a motherboard that supports all the latest technology, otherwise you might find yourself having to upgrade again soon. This article will explain the important terms and technology associated with modern day motherboards to aid you in your search for the best gaming computer motherboard. Motherboards come in several different sizes called form factors. The form factor is the dimensions (width and height) of the board. The most common is the ATX form factor and these measure 12 x 9.6 inches. 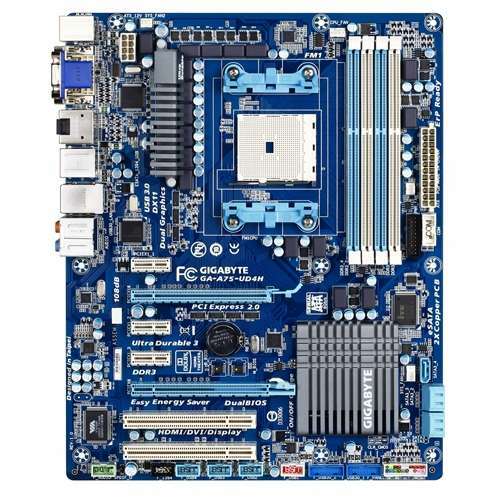 Some key characteristics of an ATX form factor motherboard include the processor located near the top of the motherboard, memory slots to the right of the CPU, and PCI slots near the bottom of the board. These changes helped standardize the industry and, as a result, ATX grew tremendously in popularity. Shown below is a typical ATX form factor motherboard. Other form factors have also emerged in recent years. Many motherboard manufacturers have switched to the micro ATX form factor. It still uses the same power supply connecters as ATX, however, but the main advantage is it's size, about 30% smaller than a normal ATX board, which is of great interest to those who like to use smaller cases for their computer builds. The micro ATX form factor measures in at 9.6 x 9.6 inches. Another form factor growing in popularity is the BTX form factor. Designed for maximum cooling and airflow, BTX motherboards connectors are in a different location than their ATX counterparts. Also, the hot air produced by the CPU is directly removed out the back of the case. By comparison, ATX motherboards blow the CPU warm air into the case where it has to be further removed by system fans. Most importantly, BTX motherboards are not compatible with ATX cases because the external connectors are located in different spots. However, the power supplies are compatible between ATX and BTX motherboards. If a sales person claims you need a special BTX power supply for your BTX motherboard, don't fall for it! The first step in deciding on a motherboard is to look for which CPU brand the board supports. Motherboards are designed to support either an AMD CPU or an Intel CPU but not both. For example, you can't install an Intel Core i5 processor in a motherboard designed for an AMD Phenom X4. AMD and Intel have decided to use different socket types to prevent a non-supported CPU from being installed into a motherboard. In other words, it is physically impossible to put a AMD CPU into an Intel supported motherboard. Please see the next section for more details. It is important to decide what CPU you will use in your gaming computer build before shopping for a motherboard as this will help narrow down your motherboard selection. Please see the gaming computer checklist guide found here for the recommended order in which to buy parts. Once you have decided on either an Intel or AMD CPU, the next thing to take into consideration is the motherboard's supported socket type. A motherboard is designed to work with a specific socket type. Just as AMD CPUs are not compatible with Intel motherboards and vice versa, an older AMD socket 775 CPU will not fit in a newer motherboard that supports the AM3 socket type. This is very important because not only do you need to make sure the CPU manufacturer is supported by the motherboard but also the socket type. The latest AMD processors use the AM3 (or AM3+) socket type whereas the Intel CPUs use the LGA 1156 for several of the Core (i3, i5, i7) processor series. Knowing which socket type a motherboard supports will help direct you as you search for your gaming computer motherboard. If you happen to see a motherboard that supports an AM2+/AM3 socket type, this indicates you can use either an AM2+ or AM3 socket type CPU with the motherboard. These boards offer some flexibility because of their ability to accept many different processors. You'll want to be sure the motherboard has a PCI Express x16 slot so you can install one the latest video cards. All the newer video cards are designed to use the PCI Express x16 slot because it produces the highest quality of visuals to date. If you are planning on using 2 video cards with NVIDIA's SLI or ATI's Crossfire technology, you'll want a motherboard with two PCI Express x16 slots. This will cost a little more but in the long run can be worth it. Also, check the amount of memory (also called RAM) the board can support. Newer games require plenty of memory to run smoothly and you want to ensure your motherboard can handle them with ease. For more information about computer memory, please see our gaming computer memory article. The latest plug and play technology is the USB 3.0 specification. It features the fastest USB technology on the market and many newer motherboards have already incorporated this on the board. If you use plenty of USB devices, I'd recommend getting a motherboard with lots of USB connectors built directly on the board. Although there are USB adapter cards you can buy, like the one found here, I prefer planning ahead and buying a board with these included. If you are planning on using several PCI devices, including a wireless or wired network card, sound card, or USB controller, be sure the motherboard has plenty of PCI slots to accommodate these devices. You don't want to find out later that there isn't enough PCI slots on your motherboard for all your devices. Occasionally you will come across motherboards that include onboard graphics. These can be identified by the (usually) blue output connector on the back panel of the motherboard. Do note that just because a motherboard has onboard graphics, this does not mean you can't install a nice video card in it. Just be sure the motherboard has a PCI Express slot as well. I would strongly encourage not to use onboard graphics as your primary graphics adapter for computer games. The onboard video was designed to handle basic graphic requirements, such as surfing the web or working with a word processor program. The onboard graphics will not suffice for a gaming computer. Get yourself a nice video card, you'll be glad you did. 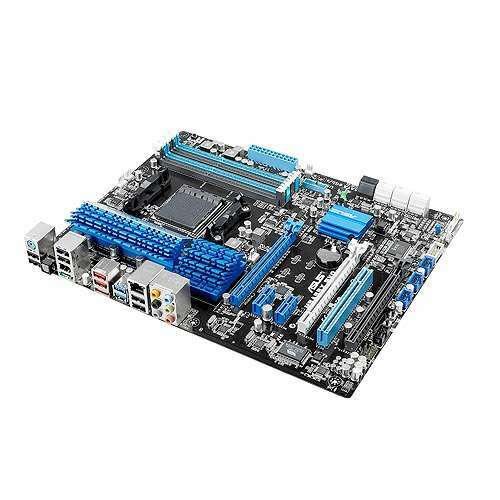 Several top motherboard manufacturers have emerged over the years and you can find them all at www.tigerdirect.com . Here at building-a-gaming-computer.com we highly recommend the Gigabyte, Asus, and MSI brands. These companies have been around for years and have received high customer feedback and we have used each in the past with excellent results. With one of the above listed brands at the core of your gaming computer build, you'll be well on your way to enjoying the latest computer games!